Throwback Thursday! Exactly two years ago, Junior experienced his first pink salmon outing on the Fraser River. His job at the time was to net the fish. This fish he is ready to graduate to actually bring one in with a rod and reel. Once every two years, many families like ours, have the privilege to enjoy this wonderful fishery for a couple of weeks. 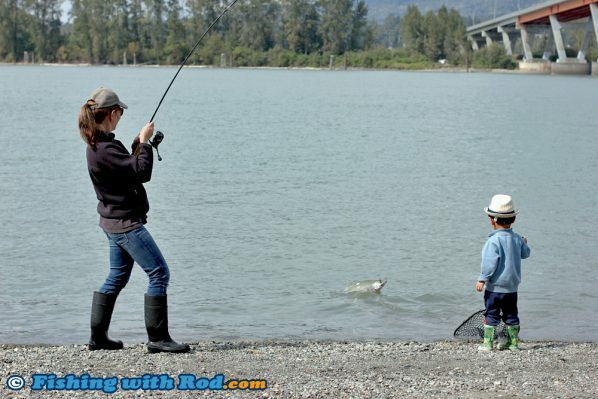 It is the perfect salmon species for young anglers. They are plentiful, eager to bite and easy to manage once on your fishing line. I’m sure many of you are frustrated (actually that is an understatement, livid might be the appropriate term) as this fishery closure continues after yesterday’s Fraser River salmon update. Comments across our social media platforms and discussion forum make that pretty evident. While I understand the frustrations, there is quite a bit of misinformation being put out there so lets lay out the facts so you know what’s going on. Most of the tributaries of the Lower Fraser River are still not seeing salmon returning yet, but things are slowly picking up. As always, Chilliwack/Vedder River is seeing both chinook salmon (which you can retain) and pink salmon (which you can catch and release) arriving daily at the moment. Secondly, First Nations have the right to have their communal food and ceremonial fisheries, please don’t suggest otherwise. The constitution of your country says so. If you would like to challenge that, the supreme court of Canada would be the venue for you to do so. Some of you have expressed your concerns on the racial remarks in the comment section. Please note that inappropriate comments do get deleted (if you can’t see the deleted comments, how would you know if comments aren’t being deleted?). Some comments that are stereotyping but not what I’d consider as racist are left alone, because both sides need to see them to understand that there is a problem when priority is given to one user group than the other. Lack of understanding from both sides leads to stereotyping, which leads to conflicts. This blame on First Nations for the demise of Fraser River salmon is unnecessary. While the amount of fish taken seems significant, it is incomparable to what commercial fisheries harvest historically. With that said, there are issues that need to be addressed. By-catches of sockeye salmon, which apparently are a major concern in recreational fisheries, exist in in-river gill net fisheries and cannot be ignored. The illegal sales of salmon from communal fisheries by some participants need to be stopped. You can do so by reporting the sales, and not buying to end the demand. Just like in recreational fisheries, a small number of people who choose not to play by the rules gives the entire user group a bad name, which should not be used to label the entire group. Rather than blaming the other user group which shares the same resource as you, your attention should shift toward those who manage these fisheries and pose questions which have been avoided repeatedly. Instead of simply shut down the entire fishery, why are we not looking at different options to provide some angling opportunities while ensuring the sustainability of vulnerable species? Why aren’t the options of opening pink salmon for catching and releasing, or reducing the retention quota to 2, or 1 fish, being considered? What is the target quota given for the First Nations, is it a fixed number of fish per year, or is it a ratio that is adjusted based on the size of the runs? And are we expecting that target to be reached before we can expect a recreational fishing opening? Why are terminal fisheries for pink salmon in systems like Chilliwack/Vedder and Harrison Rivers not being made available, when the rationale of the closure is to protect Fraser River sockeye salmon? Why is the Tidal Fraser River not open for pink salmon when incidental by-catches of sockeye salmon are unheard of due to the specific fishing techniques being employed for pink salmon? Why is the retention of dead sockeye salmon being permitted now in some First Nations communal fisheries when their low returns are the reason behind recreational fishing closures? Instead of complaining about First Nations, the lack of fishing opportunities and wanting your licences refunded here, you should be phoning Barbara Mueller, the resource manager of Fraser River (604.666.2370) and Jennifer Nener (604-666-0789) at Fisheries and Oceans Canada, who should be able to answer these for you while you address your concerns. In the past several years, this community has seen a sharp decline in interest on recreational fishing among resource managers. Instead of answering questions, resource managers have taken the silent approach in the past two years. While conservation is priority to ensure the survival of future stocks, some management decisions being made are simply wrong and their socioeconomic impacts need to be addressed. When one user group is being shut out because it is the easiest way to avoid conflicts between groups, you’re simply sweeping the problems to the side which will keep growing. The recreational fishing community cannot stand by during these closures in the name of conservation while many signs indicate otherwise. This entry was posted on Thursday, September 7th, 2017 at 1:38 pm	and is filed under Conservation, Website news and updates. You can follow any responses to this entry through the RSS 2.0 feed. Both comments and pings are currently closed. Ice Fishing in BC, a Fun Family Pastime! Save the Interior Fraser Steelhead this Christmas!